Cozie Blog » Blog Archive » I Look *Hideous*! by coie - February 12th, 2008. I have a confession. I believe I’ve idolized my car. I’ve had it almost 3 years and am known to randomly sigh, "I love my little car." If you’ve been reading my blog long, you’ll remember when I FIRST got it. In my three years of driving I have only hit a few things besides mailboxes- rabbits, birds and a small dog. One time a deer bumped the back of it as I was driving at 15mph. Tonight on my way to the Farmer’s Bureau to drop off some paperwork for car insurance, I was driving along some back roads. Since I am an advocate of telling the truth, the whole truth, and nothin’ but the truth, I’ll admit that I was going about 50 in a 40 zone. I didn’t actually know that, because I never even looked for a sign. Heck, I was in the middle of nowhere. I’m also going to take this moment to remind of an incident that happened 2 months ago. I was pulled over because my left headlight was out. I fixed it a week later. Guess what my little friend took out? My left headlight. 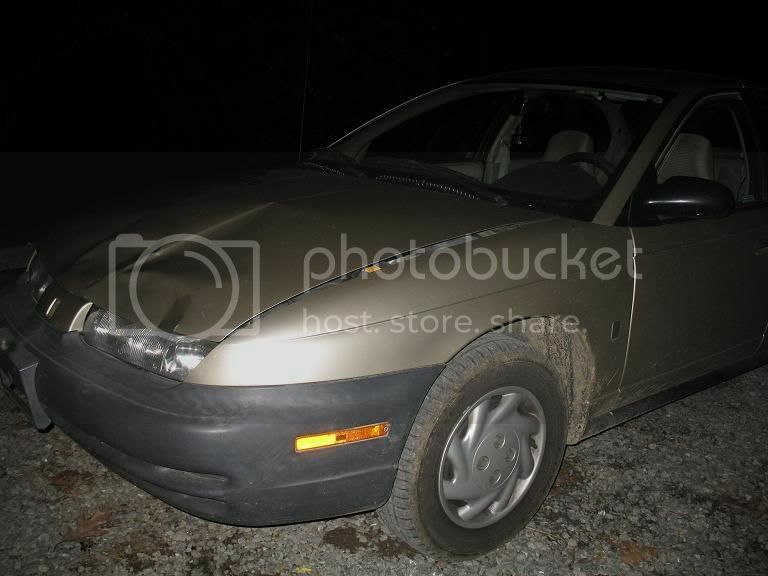 My poor little car looks awful. 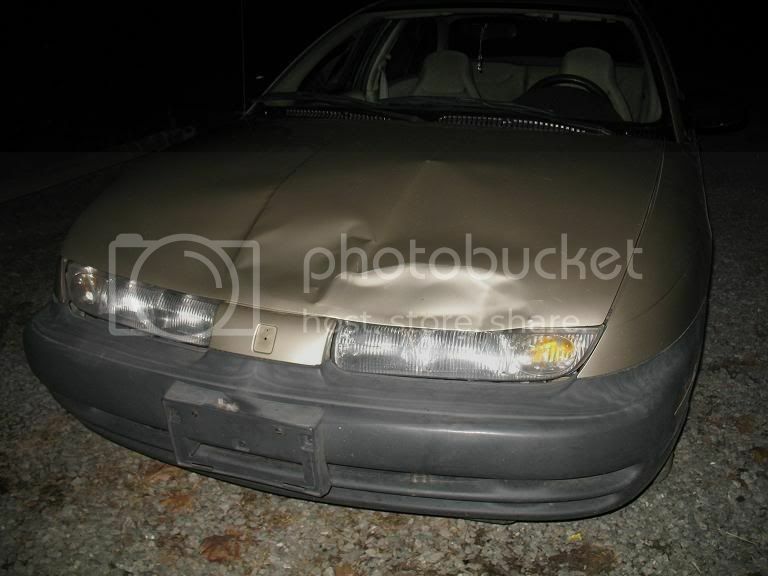 In that last picture you’ll notice the cracked headlight, some fur, and my MISSING SATURN LOGO! Ryann thinks it’s just *so* funny that I’m concerned about that. Humph. Right now I’m just thankful my car is still running. 11 Responses to I Look *Hideous*! I am not gunna let my mom see this one b/c it will only stress her out for when I drive b/c if a responsible gal like you is crashing…..
what will happen to dream girl???? *UG*, too late! Jordan ran up the stairs and ratted me out!!!! I'm so sorry about your car, Co. At least you're not hurt. Ok I have to say this! I am more worried about the deer then your car! HOW COULD YOU?!?! I mean did that deer EVER do ANYTHING to you? Did you bring it home? Us normal people in NYC DON'T eat deer we road kill! Let alone deer at all! Who cares about your car?! I'm just glad you're ALIVE, let alone uninjured!!! I am so glad you are ok. I can understand how your momsie must of felt. Did you hear that Sami is now driving. The car can most defintely be replaced but you my dear can not!! Mr R also hit a deer this year. Actually truth be told two deer hit him. One was immediately destroyed. It was not pretty. I do not have pictures so don't ask. The other one went into an embankment on the side of the road and was doing a twitching thing until the nice police officer arrived and put him out of his misery. I'm so sorry about your car, but thankful that you were not hurt. 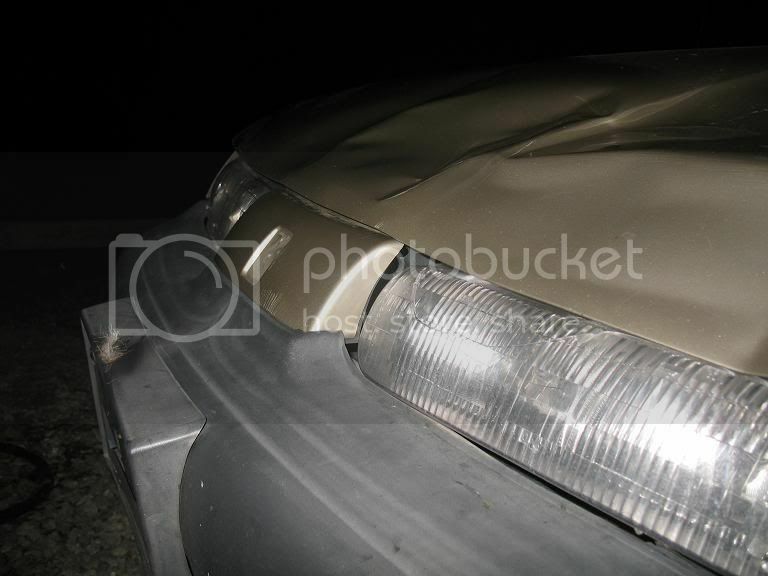 Once, while driving the only highway here on the peninsula late at night, while going around 40-45 mph, we hit a cow. He left some of his fur on our bumper as well~ We checked to see if all the children were okay, and then finding they were, we immediately bowed our heads and thanked the Lord for his gracious protection. To my oldest niece… Hoppy Day of your Birthy. I do believe however unfortunately that our meager little box will arrive late.